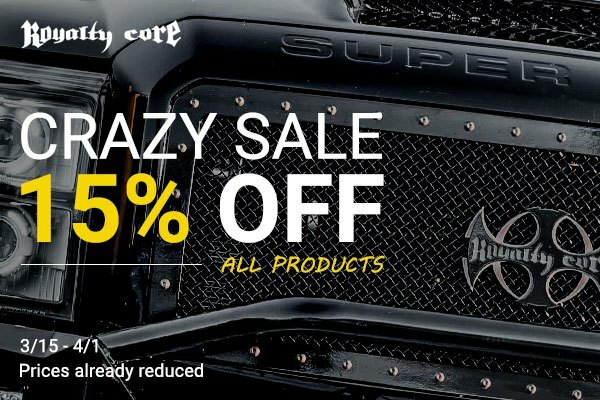 Until April 1, 2019, you have a great chance to save 15% on all Royalty Core products at CARiD. Hurry up, don't miss this exclusive offer. The prices are already reduced! Royalty Core grilles are among the most recognizable parts used on the coolest truck builds you see at SEMA and other local shows. If you want to give your Ford a custom touch, you won't find a better option. Royalty Core grilles are made of T-304 stainless steel and carefully inspected by the manufacturer to ensure excellent quality and fitment. If you have any questions about Royalty Core grilles - let us know, we will be glad to help! Quick Reply: Choose Royalty Core Products at CARiD and Get 15% OFF!